Saint Sebastian was an officer in the Roman army, esteemed even by the pagans as a good soldier, and honored by the Church ever since as a champion of Jesus Christ. Born at Narbonne, Sebastian came to Rome about the year 284 and entered the lists against the powers of evil. He found the twin brothers Marcus and Marcellinus in prison for the faith, and when they were close to yielding to the entreaties of their relatives, encouraged them to despise flesh and blood, and to die for Christ. God confirmed his words by miracles: light shone around him while he spoke; he cured the sick by his prayers; and in this divine strength he led multitudes to the faith, among them the Prefect of Rome, with his son Tiburtius. He saw his disciples die before him, and one of them came back from heaven to tell him that his own end was near. 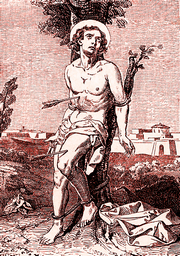 It was in a contest of fervor and charity that Saint Sebastian found the occasion of martyrdom. The Governor-Prefect of Rome was converted to the faith and afterwards retired to his estates in Campania, taking with him a great number of his fellow-converts to this place of safety. It was a question whether Polycarp the priest or Saint Sebastian should accompany the neophytes. Each was eager to stay and face the danger at Rome; finally the Pope decided that the Roman church could not spare the services of Sebastian, who therefore remained amid the perils in the city. He continued to labor at his post of danger until he was betrayed by a false disciple. He was led before Diocletian and, at the emperor's command, pierced with arrows and left for dead. God raised him up again, cured, and of his own accord he went before the emperor and conjured him to halt the persecution of the Church. Again sentenced, he was beaten to death by clubs, and crowned his labors by the merit of a double martyrdom. Reflection. Your ordinary occupations will give you opportunities of laboring for the faith. Ask help from Saint Sebastian, both wise and prudent.